Cook the pasta as per pack instructions, drain and set aside. 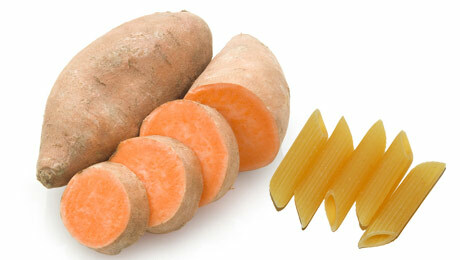 Place the sweet potato in a saucepan and just cover with water and cook for approx 20 minutes until softened. Gently sauté the onion and garlic in a small pan and cook until translucent and softened, add the peas for the last couple of minutes cooking. Pour the sweet potato, onion, garlic, peas and milk into the food processor and blend. Serve with some chopped pasta or if you prefer a smoother consistency add the pasta to the food processor for a final pulse or two. We wouldn’t really recommend freezing it with milk, though it would still be edible it may not look as appetising. what do you do with the milk? Hi Eileen, add the milk in with the sweet potato, onion, garlic, peas when putting into the food processor. If you want, pour a splash of milk in before every pulse so you can adjust how soft the puree is.